Scabies are caused by mites called human itch mites, which are eight-legged bugs. They are so small that they are not visible to the naked eye. Scabies is contracted when the mites burrow into the top layer of skin to live and feed, and the skin reacts to the mites. The major symptom of scabies is an extremely itchy rash. The mites can travel from one person to another and are therefore very contagious. Scabies is transferred primarily from skin-to-skin contact. It is also possible to contract scabies from infested bedding and other fabrics, as the mites can survive for several days without being on a human to feed. 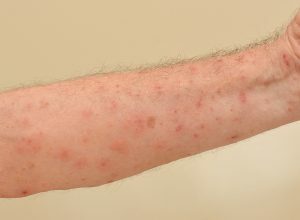 Scabies is very common and can affect anyone. It is not a condition that is related to cleanliness or tidiness. Scabies tends to spread in places that have multiple dwellings near one another, such as nursing homes, dormitories and extended-care facilities. Our office can diagnose and treat scabies very effectively and quickly.